It’s almost time to return to the best dystopia. No, I don’t mean read the news, although I can see why you’d be confused. I mean an expansion for worker placement game Euphoria: Build a Better Dystopia is in the works. Stonemaier Games will reveal about details Euphoria: Ignorance is Bliss in the coming weeks. For now, we know that the Icarites have come down from their flying city, and it sounds like they’ve taken over. I’m going to guess that doesn’t improve the situation of the general population. There was a secret government experiment out in the desert. No one knows what they wanted to create, but what they ended up with is weaponized giant killer worms. They’re hard to control, but they are so useful the government would like their eggs for further study. What happens to the worms is not important. You’re the people to do do the job in Renegade Game Studios’ Terror Below. On the surface it’s a simple game. You drive around the desert in anything from bicycles to monster trucks to collect those eggs and get paid. The interesting part happens underground. Attracted by the noise of your vehicles, the monster worms move around. Sooner or later one of them will be angry enough to burst from the ground and throw rubble all over the place. If you get hit by worm or rubble, that’s it for you. But those worms follow your noise. What if you can bait them away from those eggs you want, and right in the way of the competition. The real terror in Terror Below is not the worms. It’s other players. 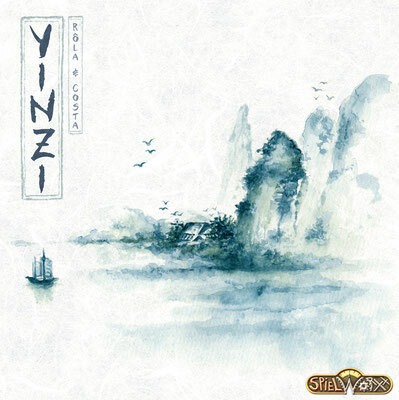 Yinzi, the next game coming from Spielworxx, challenges you to make your fortune in 17th century China. Each player controls a clan of merchants and follows many different business opportunities. Agriculture and local trade at the market, building factories, river shipping down the Yangtze to sell your goods to ships waiting in port, and all that while taxes, wars and disaster rage. You control your empire with cards. Three of them per round that you somehow make into six actions. Across four rounds that’s not a lot of actions, especially when you look at the board and see how many things you might want to do. Wolfgang Warsch continues his campaign to break into the most genres of games in the shortest possible time. This time it’s party game time in a cooperation between Wolfgang and the party-game experienced Alex Hague and Justin Vickers. Like any good party game, it’s super simple. One player knows where the bullseye is on the disk on the game board. His teammates have to guess. The player in the know may only give one hint. A card drawn shows two ends of a spectrum, like hot – cold or hairless – hairy, and the hint is something on that spectrum. The other players must know guess where on the spectrum that might be. I’m pretty hairy, but if the spectrum includes gorillas I’ll barely make the 50% mark. So what does the hint mean? The other team trying to make you doubt your ideas isn’t going to help with figuring it out. Games that mostly forego traditional mechanics and instead focus on a story for you to experience are still popular. Think of the various escape room games, or games like T.I.M.E. Stories. Pegasus Spiele have announced a series of games that will let you experience stories in yet another way. Every game in the Undo series will let you travel to key events in one person’s past where you may make a small change, hoping to avert the big tragedy at the end. With each decision you make, though, you don’t know what is yet to come and how your decision will affect the protagonist’s life. You might well end up making things worse. It’s a very interesting way to look at stories, and I’m curious how it will work mechanically. It’s a very interesting way to look at stories, and I’m curious how it will work mechanically. Can we ever have enough games where you build your own little corner of civilization from a little town to an important metropolis? 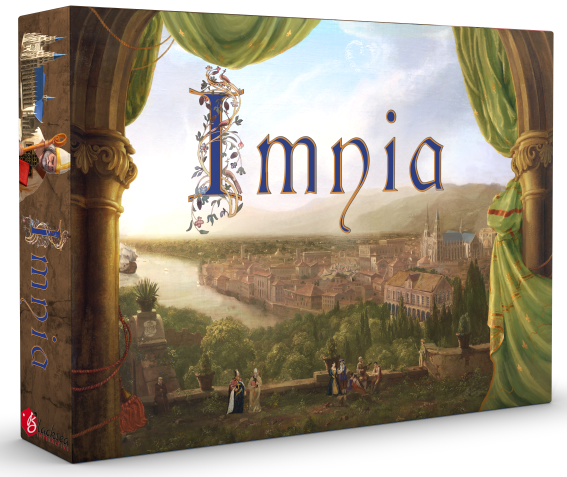 I guess not, because I just read about Imnia and I’m immediately interested. Every player starts the game with their own medieval town and builds the local economy with buildings and people they bring to their town. A player’s town is their own, private area of worker placement where they use their buildings’ abilities. To make your city grow you want to properly manage your resources, maybe participate in the exotic goods trade, and send people out on quests to boost your town’s reputation. Only when you’re reputable enough can you start building a Wonder and win the game. All the ingredients are familiar, but I’m always curious to explore how a new game makes them fit together. Hunting Mister X through London has never been quicker than in Scotland Yard – The Dice Game. Inka and Markus Brand (Village,…) and Matthias Prinz (Helios,…) re-imagine one of the most famous 1980 eurogames as a dice game that plays in around 15 minutes. The board is smaller than the original, but that doesn’t make it easier for the detectives that now have to rely on their dice rolls to move around. Mister X has to rely on the detectives’ dice as well, he can only use a mode of transport one of the detective’s used this turn. Of course he has some tricks up his sleeve, but thirteen rounds is still a long time to stay hidden. Red Peak is going to be one of those stressful games. It’s cooperative, so at least the other players won’t intentionally mess up your plans. But it’s also played in rounds of ninety seconds in which you first have to plan your route through the jungle away from the erupting volcano and then have to play the cards to actually walk your adventurer pawn along that route. So expect everyone to accidentally mess up your plans when they plan to use the same card twice, or didn’t look closely enough at the timer. You’re not getting anything for free, either. You even have to find new hand cards as rewards along the way, or you’ll simply run out. And if that’s not bad enough you can play the backside of the board where you have to pass through three landmarks on your way to the beach. Yikes! Here we have a literal engine building game. An engine building engine building game, even. The engine you build in Mechanica is a factory, and the engines it builds are robot vacuums. To win, you want to make money from selling the adorable Tidybots, selling the most of them and the best of them. To get the most, and the best, you have to upgrade your factory. As the bots move through it each machine in the factory will upgrade it or multiply it. With the supply of factory machines always changing the path to profit won’t be obvious. We recently talked about Madame, the latest scenario for T.I.M.E. Stories. What we didn’t know at the time is that it would be the final scenario in the current white cycle of the game. But that won’t be the end of T.I.M.E. Stories. W. Eric Martin of BoardGameGeek had a long talk about this with Space Cowboys’ François Doucet and reveals interesting details. What comes next will be the blue cycle, or Time Stories Revolution, starting with the scenario A Midsummer Night. The new cycle will not have a base game, each scenario will be playable by itself. There will be mechanical changes as well. The whole idea of the time track that limits what you can do during one attempt at the mission is gone. Don’t worry, though, there will be new difficulties. Time Stories Revolution will focus much more on characters. They will now each have their own deck of cards and interact differently with the environment. It’s a pretty big change for a successful product line, but I’m excited for it. What do you guys think?